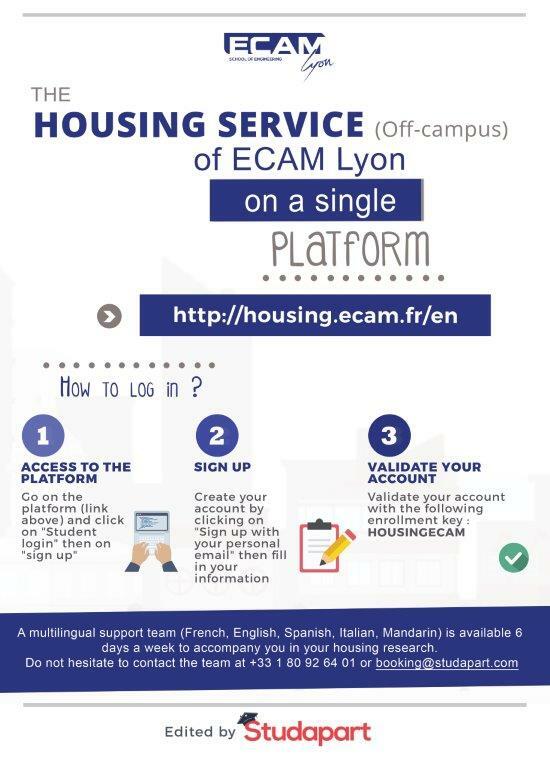 ECAM Lyon campus housing gives our students easy access to all of the on-campus events and activities, surrounds them with their friends and fellow students, offers out of the classroom learning opportunities, and of course, makes getting to class much easier. Our on-campus housing gives students a memorable experience that places them at the center of school-life while forming long lasting connections. The ECAM Lyon residences offer spectacular views of the city and are just a five-minute walk from the city center. Situated at the heart of the main level of campus, the Jean Bouisset Residence gives students the opportunity to live in a learning environment. There are 150 bedrooms on 3 floors and 4 rooms fully equipped with facilities for students with disabilities. For a nominal fee, students can rent their bed linens that are routinely changed letting students focus on their studies instead of cleaning. If something in your room or the residence hall is in need of repair, the residence hall manager is available for routine maintenance. Situated next to the Fourviere Basilica and a five-minute walk from the campus through the gardens. Log into the platform by clicking on “Student login” and use your ECAM’s login credentials. You will receive an activation code to log into the platform once you will be enrolled at ECAM. Students in the undergraduate preparatory class program are able to use the Lazaristes High School cafeteria for breakfast, lunch, and dinner. The residence halls also have dining rooms for students to prepare their own meals. Since September,2018, a new dining hall is opened. This new student facility offers meals at various times using fresh and in season products.